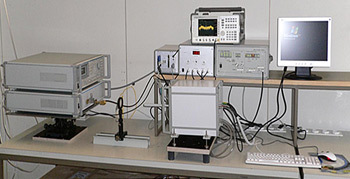 The devices based on BWOs. Important part of the synthesizers design is a phase-locked system, PLL, by 37th-55th harmonics of reference synthesizer (with upper frequency up to 20 GHz). In fact this means that a prefabricated synthesizer (for example Agilent) can be used as a reference. 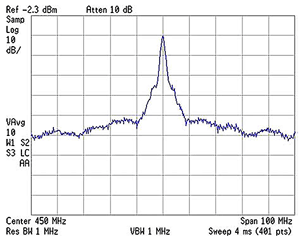 For the synthesizer 882-1100 GHz, a 3-mm wavelength synthesizer is employed as a reference. To provide high sensitivity we elaborate heterodyne receivers based on high-stable low frequency synthesizer, mixers and multipliers on superlattice structures. To further increase sensitivity of our spectrometers we work on heterodyne receivers based on HEB detectors and mixers (together with Moscow State Pedagogical University).